A Training program on "volunteerism & career development"was organised today in MMIHS. The program was focused to the last year students of Bachelor Level. Experts returned from UNs were the trainers in the program. Jiwan Prakash Sharma, ViceChairman thanked to all the team of RUNVAN for cooperating to run this program. A meeting between Liverpool John Moores University and Manmohan Memorial Institute of Health Sciences was held on 4th May 2017 in Kathmandu. Honorable Minister for Education Mr. Dhaniram Poudel, as a chief guest, Mr. Rajendra Prasad Pandey; Member of Parliament, Dr. Bansidhar Mishra; Member of Parliament, Mr. Jiwan Prakash Sharma, Dr. Sujan Babu Marhattha, Dr.Dharma Prasad Khanal, Prof. Beenu Bista, Durga Mishra and Puspa Raj Khanal from MMIHS and Dr. Edward John Harcourt, Pro-Chancellor, Prof. Laura Bishop, Dean Faculty of Sceience, Prof.Padam Simkhada, Dr.Bibha Simkhada from of Liverpool John Moores University attended the meeting. MMIHS secured 3rd Position in open essay writing competition organized by Department of Custom. Congratulations winner and thank you organizer. On the occasion of 38th National Education Day 2074 and International Literacy Day, Manmohan Memorial Institute of Health Sciences, Solteemode (run by Nepal Health Care Co-Limited) was awarded with the Best Achievement Award among the affiliated Colleges of CTEVT (Council of Technical Education and vocational Training, Sanothimi). 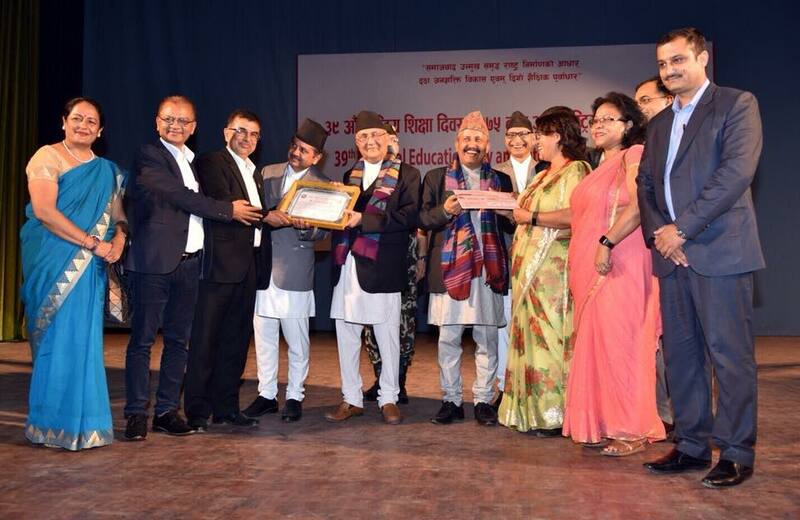 Deputy Prime Minister and Minister for Education Mr. Gopal Man Shrestha distributed the certificate and cash prize to the college. On the behalf of the college, Certificate and prize was received by Jiwan Prakash Sharma, Vice Chairman of the Institution. A Talk Program on " Educational Opportunities and Challenges for International Nurses in USA" was organized today. Prof.Dr. Geeta Pfau was the key note speaker of the program. She Stated about the challenges and opportunities of the nurses in Nepal, USA, Philippines, Africa and so on. She said that In 2016 the number of registered nurses in US was 2.86 million. She shared her 40 year experiences of about the concerned field from the practical aspect. She also made a slide presentation with the current position of nursing of the world with data's .The nursing faculties & Students of BSC NSG, BNS, & MN were the Participation of the program. Prof. Bishnu Bhattarai Campus Chief Welcomed the Keynote Speaker, guests and Participations.Prof Dr Sujan Babu Marahatta, Asst campuschief made a presentation about the college. The Program ended with closing remarks of the vice chairman Jiwan Prakash Sharma. He presented the Token of Love to the Keynote Speaker. The Program remained very fruitful & Practical. MEMORANDUM OF Agreement was signed between Bournemouth University (BU) UK and MMIHS to develop partnership with focus on the exchange and transfer of ideas, knowledge, skills and training. On the behalf of BU Professor John Vinney, the vice-chancellor and Honorable Rajendra P Pande the Chairman of MMIHS signed the letter of agreement. Jiwan Prakash Sharma, Vice Chairman, Bishnu Bhattarai, Campus Chief & Dr. Sujan Babu Marahatta, Assistant Campus Chief & Prof. Edwin Van & Prof.Padam Simkhada, Visiting Professors were present in the signing ceremony. Manmohan Memorial Institute of Health Sciences, Soalteemode Kathmandu organized an orientation program to the newly admitted students of Master in Public Health (MPH) & Master in Nursing (MN). Asst. Dean of TU, IOM Prof. Mandira Onta, as a chief guest, MPA Rajendra Prasad Pandey, Chairman, Dr.Banshidhar Mishra, Jiwan Prakash Sharma, Sulochana Shrestha, Maharajgung Nursing Campus Chief, Sarala KC, Dean of Nursing Facutly PAS, Jiwan Malla, MoH Representatative, Dr. Sujan Babu Marahatta, act. Campus Chief, Prof. Binu Bista, HoD, Nursing Department and Durga Mishra, HoD, Public health Department oriented the students on the program. Visiting Professor of Liverpool John moores University Prof.Padam Simkhada and Prof Edwin van Teijlingen, Bournemouth University of UK also expressed their best wishes from offline video message. A one day workshop on "Mixed Method" was jointly organized today by MMIHS & Bournemouth University. The Participants (faculty and post graduate study) from IOM Medicine, Nepal Army Institute of Health Sciences & Manmohan Memorial Institute of Health Sciences took part in the workshop. Prof. Edwin, Prof. Dr. Sujan Babu Marahatta, Dr. Bibha & Dr. Shanti facilitated the workshop. The program was concluded with the closing remarks of Vice Chairman Mr. Jiwan Prakash Sharma & certificates were distributed to the participants. Nepal Health Care Coperative Limited (NEHCO-NEPAL) was established 2006 with the aim to work in the field of health science education and to institutalize the contribution of late Manmohan Adhikari. Manmohan Memorial Institute of Health Sciences (MMIHS) was established in the year 2007. Both wings were established under the name of Former Prime Minister Late Manmohan Adhikari, a great patriot and renowned leader of Nepal and of South Asia. NEHCO is committed to invest its efforts to ensure the quality health care delivery and to provide the practical as well as scientific education through the cooperative initiatives. MMIHS is one of the wings of NEHCO registered under cooperative act of Nepal. The registration of MMIHS is 904/062-63. Manmohan Memorial Institute of Health Sciences (MMIHS) is an academic institution of allied health and nursing run under the umbrella of Nepal Health Care Cooperative Limited (NEHCO) . MMIHS is the product of untiring efforts of academicians, researchers, industrialists and prominent professional with extensive exposure to a wide range of knowledge, experience and teaching / learning practices. The college is committed to provide quality, practical and real life based education and aims to be A CENTRE OF EXCELLENCE through quality education, research and services.